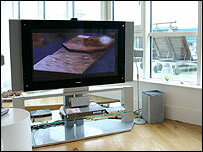 The US House of Representatives passes plans to switch off analogue TV signals by February 2009. Six major Hollywood studios form a joint venture to help protect their movies from electronic piracy. File-sharing group Grokster shuts its service as part of a landmark settlement with the entertainment industry. Ricky Gervais returns to radio with a series of weekly shows for download over the internet. Electronic Arts reports a 31% drop in profits, hit by the cost of developing for new gaming consoles. Warner Home Video announces it will release movies and other content on Universal Media Disc (UMD). Electronics giant Sony launches a slim gadget it hopes will turn people on to downloadable digital books.